The asteroid 4864 Nimoy, a 6-mile-wide chunk of rock in the main asteroid belt, was renamed in honor of the "Star Trek" actor on June 2. The legacy of Leonard Nimoy has reached the Final Frontier: on June 2, a 6-mile-wide (9.6 km) asteroid was named 4864 Nimoy in his honor. 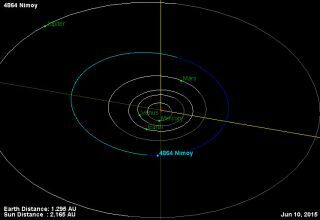 The asteroid travels within the main asteroid belt — between Mars and Jupiter — and orbits the sun every 3.9 years. It was originally discovered at the European Southern Observatory in 1988. Nimoy, who died in February at age 83, is beloved as the character Mr. Spock in "Star Trek," and this isn't the first time that his character's namesake has been in space — more or less. In 1985, an astronomer, James Gibson, named an asteroid 2309 Mr. Spock after the cat that accompanied him as he worked long hours at an observatory in Argentina. The cat itself was named for its pointy-eared resemblance to the "Star Trek" character originated by Nimoy. Gibson argued that asteroids should be named only for those who had contributed to or had been important to astronomy in some way, and that his cat, by keeping him company during his work, fit the bill. Nonetheless, the naming started a debate that culminated in the IAU asking that asteroids not be named for pets. This new asteroid is named for Nimoy himself, whose portrayal of Spock has undoubtedly contributed to many budding scientists' fascination and wonder at the universe. Nimoy himself has also been involved in space science, narrating a video about NASA's Dawn asteroid mission and speaking at the space shuttle Enterprise’s landing. Given the impact "Star Trek" has had on how the public perceives space exploration, honoring Leonard Nimoy's legacy as Spock with an asteroid, in our view, is only logical.